The cautionary tale is now available. Another triumph to science! I've closed jspwiki.org as a protest. Full explanation on the site. Yawning has amazing power. We truly are social creatures. (And BTW, if this entry made you yawn, drop a comment =). Why? After deleting the 1773 spam messages from my spam folder (21 days worth - thank you, SpamAssassin), I'm rather inclined to agree with people who say that email is dying, and we need something better. I also found this excellent RSS primer for publishers and content producers, which does explain rather nicely what RSS is and why we should care. As for new internet standards, LOAF is possibly the most promising one. I cannot believe this innovation has not been made earlier, since it just makes the life of all weblog authors and platform builders so much easier! I can't wait - like Britta, and Joi Ito - for the LOAF standard to be finalized. Much like Atom project shows the power of WikiWikis, LOAF shows the power of IRC. Obviously, JSPWiki will be one of the first to support LOAF, once it hits beta. "I took exception. I took offense," [police officer] Solden told Bruce. "We've tried to elevate this street. I'm offended because you broke the law. I mean it sincerely. I mean it. I can't see any right, any way you can break this word down, our society is not geared to it." Bruce said, "You break it down by talking about it ... How about a word like 'clap'?" "Well, 'clap' is a better word than 'cocksucker,'" Solden replied. "Not if you get the clap from a cocksucker," Bruce rejoined. OK guys, calm down about the Mars thing already. I know it's close to Earth, but still, it's not like this is the only time you can ever view it. Especially here in Northern Europe, you can see it much better later on when it climbs up in the sky: at the moment it is so low that any bonus given by the distance is compensated for by the low elevation and pollution. However, it reminds me of one thing: The Czech government has issued a law against light pollution (space.com story is good, too, the law text is here), which I think is a really good idea. From June, the authorities will be required to shield lamp-post lights and other public illumination to control the spread of light, and use flat rather than curved-belly glass to prevent light shooting upwards and sideways. Teams of astronomers will work with energy conservationists, lighting engineers and the public to limit the amount of 'wasted' light. Advertising billboards will have to be lit from above, with their lights pointing downwards. The law is not only a good idea because of the diminished light pollution, but also because it just does not make any sense to light the night sky - nobody save a few astronauts and pilots are enjoying the view anyway. We can save a lot of energy by pointing our lights downwards... Actually, I think that a similar kind of law has been passed around in the Finnish parliament as well, but so far it has not actualized. But anyway, if gazing at Mars makes you happy now, then don't forget to take a look at the other wonders of the universe from time to time as well. I made a page of all the entries I made during Ropecon 2003 for your easy consumption. I haven't yet sorted through all of the pictures I took, so for them you'll have to wait a bit more. I'm enjoying -if that is the right word - this plate of vietnamese deep fried pork on the Joensuu market place. It's got far more deep fry than pork, but the rice is okay though. There's a flea market here, too. Can't say it's terribly exciting - and it pains me to see how some salesman are exposing their books to rain. ...is short but luckily there is usually only little snow. This particular patch is in Joensuu, where my brother is getting married today. Oh well. A walk probably does some good anyway after three hours in the train. I've mentioned this before, but the subject came up yesterday at the blog meeting. I'm a Finn but I write this blog in English. That's fine, no worries, but it keeps me quite separate from the Finnish blog community. Obviously, since a big part of my readership seems to come from abroad, I cannot easily comment on the writings that my fellow Finnish bloggers produce - they would not be able to read the original articles! So I would have to recap the discussion in English, and that is just a bit too much to ask. On the other hand, the Finnish blogosphere is rather small, about 400 blogs, and as such a lot of the discussions (such as the ubiquitous ATM discussion, or the "market value theory" -discussion - trust me, you don't want to know about these) tend to revolve around the same issues and the same people, which pretty easily makes them personal. And such conversations are probably better kept within the Finns anyway, and a lot of us don't read them either. In a way, I am relieved that I have this very good excuse not to take part in them. However, there are also some very good writers, interesting opinions, and - sometimes - deep insights. Few of the foreign people can read these - but we can read all of the good stuff English-speaking people produce! Nyah, nyah! I don't know if this is a real problem - it certainly is not a problem to Finnish bloggers; only perhaps to some who hang there, inbetween, like me. But it certainly makes me different; not quite fluent enough in English to write interestingly, but not really willing to write in Finnish either... Then again, it would be really boring if we all blogged in Finnish, because then our part of the blogosphere would be completely shut to the world. Now at least some people can get a bit of insight into what is happening here, even though the English of most writers is not perfect. It's all in the interest of world peace and understanding :-). Today, I've mostly spent my time in saunas. All kinds of saunas, from electric to an authentic smoke sauna, six times over. Which is not really a very bad way of spending your day, you know. It certainly beats making Powerpoint presentations. So, TheFeature launches their new website with much commotion. They are now very weblog, slashdot, hip and trendy. They bring in Justin Hall and a bunch of other celebrities. But they forget the key glue that is holding the weblog world together - the single most important thing that has risen from the weblog world, something that is powerful enough to fight about. I've got a ~BlogBlock. Can't think of anything to say over here, even though I've been blogging like crazy to my other blogs (and let that be the mystery of the day). Brendyn has created a page that lists the online/offline status from jibot as titles and links to all of the recent blog entries of the regulars on #joiito from their RSS feeds. Very cool! I think you can view the IM status information, NowPlaying-lists and blogs as the opposite ends of one big axis called "presence". At the other end, you have these automatically updated things that show a small piece of your persona, and at the other end, you have complex, manually updated, annotated, verbose descriptions about your persona. But in a way, they both announce your presence and existence to the world: "I am here! I do this! I like that!" We all want to live forever, I guess, and bloggers more than others. Alastair Reynolds writes in his book "Revelation Space" about so-called "beta"-level computer simulations, that grow by watching your reactions and responses over decades, and when you finally die, the computer simulations continue to preserve your persona and knowledge for the posterity. Most of the stuff we put on-line is being archived by Google and Internet Archive, and probably by hundreds of other sites as well. In theory, armed with sophisticated algorithms, and a life-long archive of blog posts, you might be able to construct an artificial personality of any blogger. Not that it would be close to the real thing, as people tend to write about their idealized self-image, but perhaps it might be convincing enough to be used for things. Which movie do you belong in? Link through Merten, who at least got a cool movie. Is there a better way to start off a Monday morning than be told that you should really be living in a world where violence is the answer to everything (properly applied and administered, of course), and where you can gain cool powers just by dressing in plastic and striking funny poses? Not to mention being able to combine yourself with similarly dressed weirdos to gain even cooler powers? To be the idol of pre-schoolers? Here's something I didn't know: You can buy cell phones at gas stations these days. Also, a Finnish hamburger chain is now a cell phone operator, too. OK, so there's a blackout on the East Coast of USA. What happens? Someone makes a moblog, where people can send their images of the blackout, documenting the whole thing in real time. I can only expect this kind of stuff to happen more and more in the future. Not blackouts, but people becoming reporters spontaneously. It is a powerful concept... And far more real time and interesting than what the major media can do. Unfortunately, it also means more noise; and thus should be subjected to some editing. But it is a powerful concept nonetheless. Nice ring to a headline, isn't it? If USA were source code, I would certainly qualify the following news items as a bad smell. Penthouse files for Chapter 11 protection: Penthouse's circulation has dropped dramatically - down from a peak of 5 million copies to just 530,000 in December. CNN: Dismayed Americans Contemplate Canada: "For me, it's a no-brainer"
Freenet developer Ian Clarke leaving USA: As an Irish citizen living in the US - I have decided that it is time to leave this country - it is starting to look, smell, and act as Germany did during the 1930s. Joichi Ito says that email is officially broken, referring to a recent statistics which says that 17% of all legit email is being canned by the spam blockers. It seems though that this is mostly a problem with the major ISPs: My own SpamAssassin seems to work nicely, with a very low rate of false positives. But still, strong host authentication on SMTP looks like the right way to go. Of course, it will not work properly until every computer in the world gets an update so that we can turn off all the old mail servers and stop accepting non-authenticated hosts. Hm. Unfortunately this means that life will be a bit more difficult for those who actually need anonymous email: while anonymizer services will still continue, having their computers hacked or confiscated should reveal the identity of the sender in a way that is usable as hard evidence in a court of law. Then again, a newly designed SMTP protocol would probably support encryption as a default option, so we would have better, but more brittle privacy all around. TANSTAAFL. P: I don't know that those two numbers were. S: Yeah, I knew you didn't know. I don't know them either. P: Ah, in that case I know the numbers. S: Yes, now I know them too. What were those two numbers? "You are Marcus Cole. An honest and chivalrous adventurer that pursues just causes, you would sacrifice much to help others." 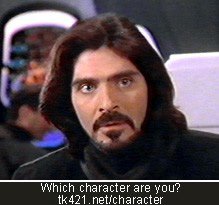 Which sci-fi character are you, stolen from Merten. Frankly, I always found Marcus rather dumb, and a hopeless romantic - but hey, that's what you get when you answer questions like "would you kill your best friend to gain immortality?" It's really bloody hard to answer anything sensible to a stupid question like that; you really never know until you actually are in that situation, and before that all thoughts and discussion is hypothetical based on an idealized self-image. It does perhaps some good to really think about hypothetical situations, so that you are not completely out of touch with yourself if something unlikely hits you - but still. You ain't what you believe you are. Well, on the other hand, I guess Marcus is not really such a bad idealized self-image to have :-). Project Atom has really taken wikis to a new dimension, I think. For the first time, a wiki is being used as the main collaboration environment for building a project publically. Whether the project fails or succeeeds is actually irrelevant - I think the main contribution from the Atom Project is the way of working - and the realization that it actually is possible to build an open standard in such a way. It remains to be seen what else can be done by combining wikis and IRC. I think it's a good concept; having done one small project where we used a chat and a wiki simultaneously to make a quick hack, I can say that it was the most comfortable way of working with people that are all across the globe that I have seen yet. There's some discussion already on JSPWiki:IdeasInstantMessagingWiki. Anyway, we'll be trying this on #jspwiki in the near future. It's a high time that we got the wiki cleaned... I am not expecting a big rush of eager people, but if we could do something with a few individuals, it would be cool. See JSPWiki:WikiGardener. Merten says that Justin Hall, the ur-blogger, is coming to Helsinki. I have perhaps complained before about the lack of free weekends during summer, and this is turning out to be a major conflict... I have now four places I have to or would like to be next weekend :-(. Oh well. By November I am going to be bored out of my skull anyway. I will never, ever, ever, ever, ever drink alcohol again. This particular "soft golem" (his own words) liked water so much we ended up going to sauna with him, swimming with him, and having showers with him. Let this be another example of showerblogging. The con afterparty was... nice, and we ended up to have a continuation party after a continuation party. I can assure you that every word that I write here is a product of serious contemplation, as I seem to be unable to type the simplest word without errors, Gnröf. Anyway, this year's con went past flying. I don't know how that's possible, but I didn't get into the "con mood" until somewhere around Saturday evening, and then the con was halfway over anyway. I was also extraordinarily tired, and perhaps a bit feverish too. It's hard to understand that it's already over now. It just got started! Mike was very popular all weekend. I also apologize for this sudden carnal turn this blog has taken. The first Finnish Roleplaying Book Author Mike Pohjola signing body parts for enthusiastic young fans. [#1] Many Finnish role playing games exist, but this is the first book. I don't even pretend to understand the difference. This is how we keep awake and hyperactive in the night watch... Sugar! Henri and his new toy. Yes, it is difficult to use a phone with a gauntlet. "Hey, can you give me the key to the storage room?" "Err... Do you work here?" "Yeah, I am the head organizer." ...is always in the staff room. We're waiting to see the new Star Wreck trailer, but unfortunately it is 200 km away, traveling here at 200 km/hour... So we'll be hearing an impromptu "making of". Take 10 live-roleplayers in their favorite characters, steal the format from the dating game, and add an audience that is fully embracing the idea. Fun! Settlers and robots... They're all here. The craze is here, too. Tape Survivor, since you're not going to get much time to get home anyway. Buy fridge full of food, since you will not have time to go shopping. But buy only food you can eat also later next week, in case you don't come home until Sunday. Charge all electronic equipment, especially the camera. Don't forget to take the camera charger. Load up on cash, because the local ATMs might run out of it. Be sure you're well rested, since there is no rest in the 'con. Thought I was over it, but wasn't. How a simple thing like a piece of music can suddenly bring certain memories back with such extreme vividity, I'll never know. Why does modern music sound so crap? Here's an interesting article to explain it: It's the square waves. Since I seem to be back for good in IRC, I established an IRC channel on freenode for JSPWiki support, called #jspwiki. There are already a couple of people hanging about on it; feel free to join in. :-) There's already a home page for the channel, too. I'll be there as "Ecyrd", except when I am asleep, working, or doing something else remotely useful. The mailing list never really caught on; perhaps IRC will? Don Park moblogs with a pen and a paper. Of course, how do you search such a blog? Update: Nice observation in the comments of the above entry: "Semantic web be damned." Yeah. Perhaps we really don't need the search after all; just treat all blogging as transient. ...always double-check your regular expressions. Especially if there's a "rm -rf" somewhere on the command line. I just accidentally destroyed several megabytes worth of data from a Wiki, and of course the restore system fails at the same time. Gngh. Well, luckily I am so paranoid I actually have double -backups of all important data. The short period of time that occurs when you're almost late from an appointment, but your clock is not on time. During phantom time you don't know whether you're late or not; you might have time, or you might already be late. It's kinda like a lease that can suddenly be unilaterally terminated, but not by you. Dunno... I often catch myself in these phantom moments. It's scary how you get this idea all by yourself while cycling home, and then the next morning you find that someone else has thought about the same thing and blogged it during the night. Ever since I started IRC, I've noticed that I'm reading much less email, getting a lot less structured work done, but having a much better sense of what's going on in our "space" and able to tie a bunch of pieces together that weren't tied together before. I think some people mistake this type of contextual multi-tasking as some form of ADD. So, I shall not talk about time, since he already did so, but I'll talk about packetized conversations. In the old days, we had these huge packets (letters), that travelled slowly. Then we got email, and started sending smaller packets. With weblogs, we found broadcast traffic. And with IRC and other many-to-many chat systems, we have very small packets, with fast transmission and very low latency. It's kinda like the UDP/IP of human communication. So, it's no wonder that Joi and others are now prioritizing chat to email. However, what I am worried about is persistence. While IRC can be logged, the conversation there is not usually archivable and searchable, unlike email, weblogs and wikis. How much knowledge will we lose if a huge chunk of the online communication disappears into the bit bucket? Do we care, i.e. is that discussion worth saving in the first place? Heyhey, this is seriously cool: The Open Guide to London is a Wiki, much in the Wikipedia style. In fact, all of the OpenGuides.org web site seems to be working on the same principle. Yes, knowledge repositories and other areas that benefit from massively parallel data processing (i.e. a bunch of people writing, fact-checking, revising, and updating) are the right areas for Wikis. A company intranet, or a project worksite is very good ground for a wiki, but wikis are not very well suited for discussion, so they tend to grow out of control quickly. At the very least, they require someone who wants to edit the discussions into a readable form. However, an encyclopedia rarely requires deep discussion, so a Wiki is a very logical choice for something like that. Hm. Makes you wonder - what would be the correct way to add discussion capabilities to a Wiki - a WebLog facility certainly helps, but it's still no substitute for a good discussion board. And still, the transference of the discussion onto a WikiPage is a problem. Friendster, LinkedIn... Who needs friends? Greg Storey presents Introvertster, The New Way To Get Rid Of People. If God exists, then if reason exists then God exists. God, existing, is either necessary or unnecessary. God is not unnecessary, therefore God must be necessary. Person X, a well-known atheist, was morally inferior to the rest of us. It raises a question though: why does one have to justify being an atheist, but those that believe in God usually never have to justify their belief? Perhaps it is because there is no rationalization for faith? Or is it just because not believing is not the norm? OK, I've had my share of things that could be called "religious experiences" so that I know that they are really hard to approach rationally, and that it is difficult to explain them to people who have not had them. I know it's also easy to get into this "holier than thou" -attitude: "You don't know what I've experienced, and I've seen so much better stuff that you simply must be wrong." But it is not so. It is a misinterpretation. Believing in God does not make one a better person. It may do that, and all those people who found God in prison, or otherwise reformed their life because of that: "Good for you!" But really, what you say and do has more relevance than what you think or believe in. Student asks master: "What is enlightenment?" Master says: "First, mountains and lakes are mountains and lakes. When you try to understand, mountains and lakes are not mountains and lakes. And once you achieve enlightenment, the mountains are mountains, and the lakes are lakes. Sorry about the rambling. Difficult subject, Monday, first coffee break of the months of drudgery of work. Back home. Saw Hulk. Movie good. Very comic-like. Nice transitions. Now tired. Need sleep. Work tomorrow. Sci-fi, agent comics, tech magazine, or go problems? Sci-fi, agent comics, tech magazine, or go problems? This tree has been growing like this for at least ten years. Each year I am surprised to see it still alive, expecting that this winter the ice had finally destroyed its roots beyond repair, or the snow had broken it. But it just keeps going. One has to admire that. I guess that there are many cliche-y lessons in all this, but I think it demonstrates well the sheer stubbornness of life. No matter what the conditions, giving in is not an option. Sometimes we people tend to forget that. I think he would've fit perfectly onto the boat with the three men, yes? He loves sailing. We have no idea why. And yes, my dear readers, I am aware that my blog has recently been most uninforming and self-centered. We will resume normal transmissions on Monday, as I again return to the megacorporation that pays my wages.